Being festooned with all sorts of nodes in just about every nook and cranny furniture rooms can appear quite complicated at first glance. 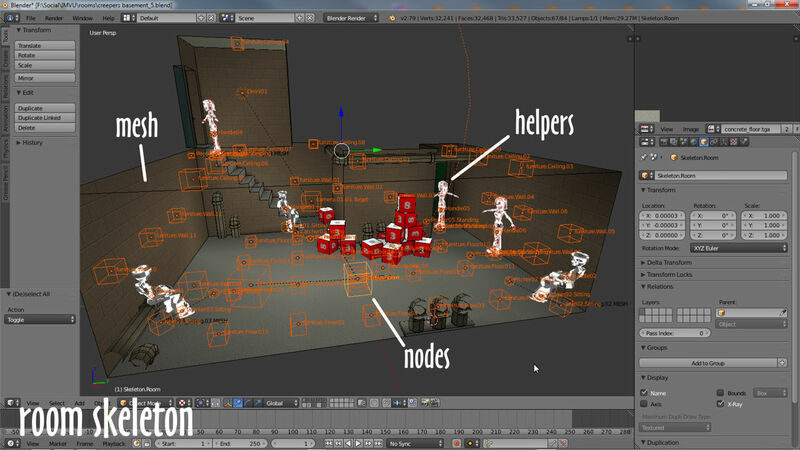 On closer inspection their skeletons can be broken down into several sets of nodes based on what they do; a set of core nodes that define the room, furniture nodes to accommodate furniture items and seat nodes for avatar placement. How they are organised and linked together determines how the room can be used. A simple basement mesh accompanied by its skeleton, a series of nodes that accommodate furniture and avatars. 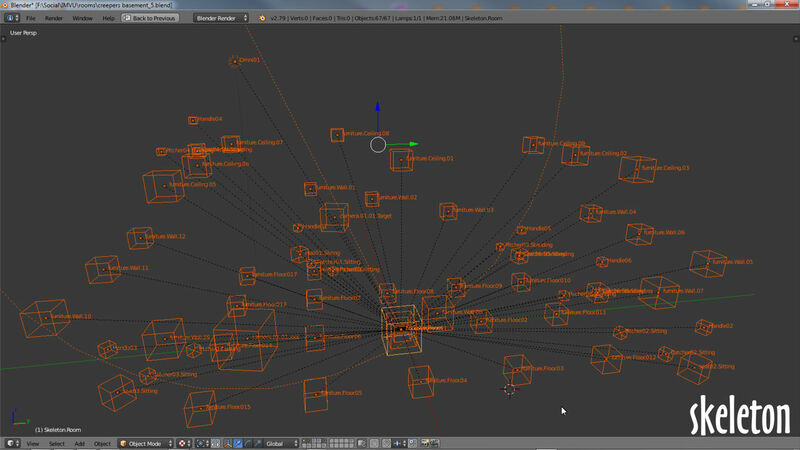 With the availability of FBX exporting, rooms can now be made in Blender using optional ‘nodes’ solely, or in combination with the more traditional route, an Armature and bones – nodes differ from both Armatures and Bones in that they’re simply reference objects, an Empty, that cannot be significantly edited. 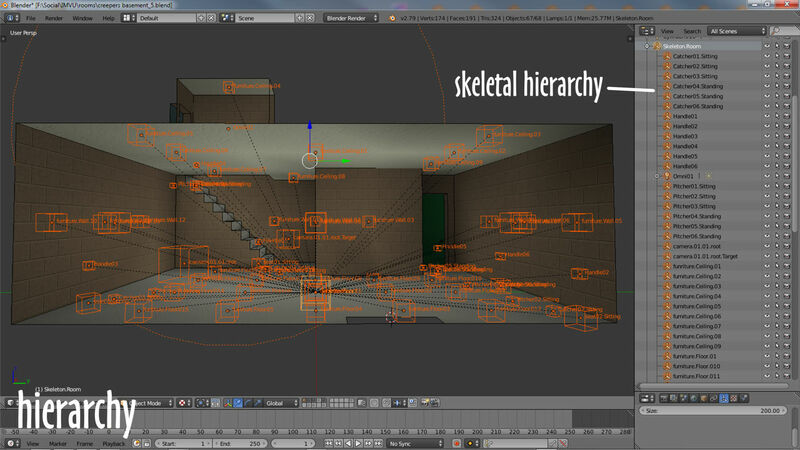 All nodes within a room link to Skeleton.Room which sits at the top of the hierarchy – the link between nodes highlights as a dashed line in Blender, Child » Parent. 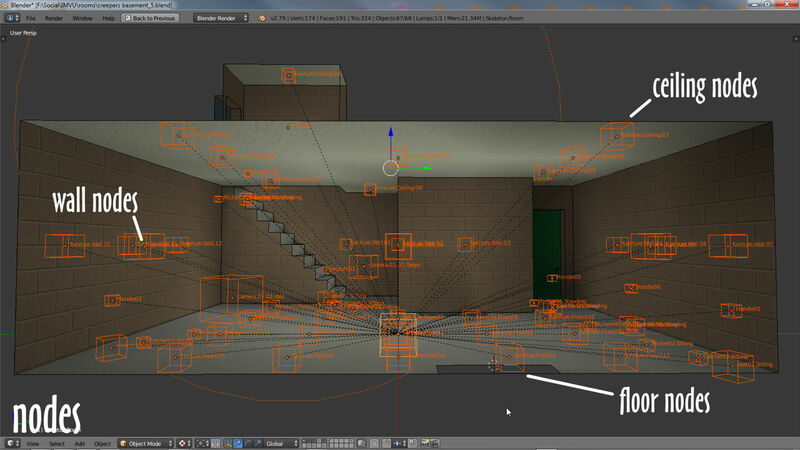 With the exception of Skeleton.Room and node.Room, which are located at grid-centre in Blender (0,0,0 on the XYZ axes), all other nodes can be placed wherever they might add functionality to a room, furniture nodes are often placed on a uniform grid for example, typically 1 metre (Unit in Blender) apart, but can be placed anywhere, on a cliff-face or under water. Similarly for avatar spots, they too could be up a cliff or under water. There are three types of furniture, floor, wall and ceiling, each identified by their name . This helps IMVU determine what type of furniture, and their orientation (Z being the primary axis of orientation), is generally associated with which node. The position of room nodes is relative to their function within the room, floor nodes are generally aligned to ground surfaces for example, but can be placed anywhere. Even small rooms can have a tremendous number of nodes.